Agro Engineering Works is a professional company, manufacturing Hand Steel Shovel of excellent quality. To cater to the diverse requirements of the clients, we supply Agro Brand Steel Shovel in different varieties, namely Square Nose Shovels and Round Nose Shovels. To manufacture these Steel Shovels we use best quality raw material to ensure long life and win the trust of the users. 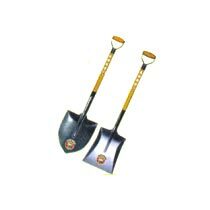 Agro Brand Square Nose and Round Nose Shovels and Spades are formed in one piece from 14 gauge (2mm approximately) Carbon steel Sheets. The Shovels are fitted with Strong Steel Crutched wooden Handles. PVC Handle reinforced with steel ERW pipe is also available at an extra cost. The Blades of Shovels bear the Registered Agro Word (Embossed) and also water Transfer Label Logo of Crocodile Device. Each and every Agro shovel is packed individually in polythene covering to protect it from dust and rust till it reaches the final user. All types of Shovels and spades are made available to distributors, dealers, resellers in marketable lot of 6 (Six) pieces securely packed with polyurethane gunny bags on the handle section. Packing Size (Approx) : 1010 x 275 x 330 mm. 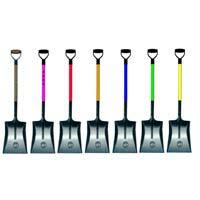 Number of Shovelâï¿½ï¿½s in each Bundle : 6 Pieces.